For many Russians, hunting is no mere pastime. It is a family tradition and an important element of their lifestyle. Foreign hunters come to Russia frequently for valuable trophies and the opportunity to track down game in pristine natural conditions. In Russian, hunting is rarely just a hobby. For many it is an important part of their lifestyle and a way of keeping in touch with the traditions and skills their ancestors perfected in order to stay alive. In recent years, many foreign hunters have also come to Russia, drawn by the allure of the pristine wilderness and coveted trophies such as moose and bear. Alexei has been hunting since he was a teenager. His father first took him to a driven hunt when he was twelve. Alexei lives in Yakutia, in eastern Siberia, and according to local tradition a man simply must be the breadwinner and be capable of hunting and catching the game considered essential to the diet. “We have a saying that a vegetarian is a poor hunter who couldn’t catch any game,” says the young man. Alexei participates in the hunt each season. It is not possible to hunt more than 20 days a year, in spring and fall. The periods of this hunt are determined by the authorities in order to avoid the depletion of natural resources. “I try to make arrangements at work and take a vacation so I can go out into the taiga,” he tells us. At the same time, he does not especially enjoy trophy hunting, although he says many Russians and foreigners come to Yakutia to bag unique animals. “The local authorities, for example, issue several dozens of permits allowing the shooting of rare animals so that people are attracted to our region for the purposes of hunting. For instance, one can come here, rent guides, and go to hunt a mountain sheep,” explains Alexei. The young man says that as he is still not an extremely experienced hunter, he does not yet take the risk of hunting large beasts such as moose or bear. Several years ago a new law called “On the conservation of game resources” was passed in Russia, and now hunting permits have become more difficult to obtain. Alex notes that this fact is of great irritation to the local inhabitants, who have hunted on the same territories for generations. Alexander lives in Moscow, but to hunt for wild boar and elk he travels to the nearby regions of Yaroslavl, Kostroma, Kaluga, and Tver. He prefers to come to a hunting ground where everything is already organized, where there is a place for overnight stays and where there is a local huntsman who can explain everything about the situation. “We usually get together in a group of 8-12 people and go for the weekend. We choose people for the team very carefully because it is important to trust the people you are going to be in a wild place with when they have guns,” says Alexander, explaining that they also have a policy of refraining from alcohol consumption on such trips since it could result in injury. “Once a couple friends and I went with a team we didn’t know well and those people really got into the alcohol. So we decided we wouldn’t go on the hunt with them, and that decision turned out to be correct because, as a result, one of them with a hangover shot his buddy in the leg as they were returning from the forest,” says Alexander . Alexander’s father-in-law got him into hunting, taking him with him and teaching him how to understand the behavior of animals. “It is very important to have a mentor because a man will not figure out all by himself what to do in the forest with a gun,” he notes. 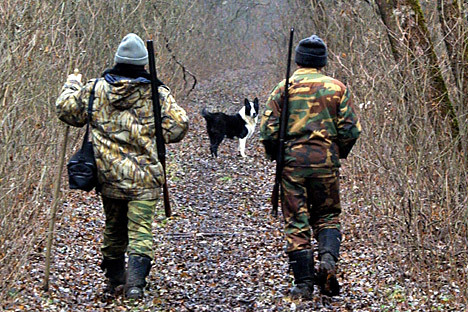 Hunting is quite popular among Russians and it attracts people from various social backgrounds. Older men typically occupy themselves with the simplest kind of hunt, the hunt for waterfowl. The license is not expensive but the process is labor intensive; it involves a lot of walking. There is also hunting for larger beasts, which is more expensive. For example, a moose hunting license costs about US$2,500, which hunters – usually about ten – divide between themselves. But there are still transport, equipment, and accommodation costs. This is why big game hunting attracts people of medium income. Trophy hunting is the most expensive kind of hunting; it can cost upwards of tens of thousands of dollars so it is primarily a sport for wealthy people. Game warden Alexei Bystrov says that foreigners very much love coming to Russia to hunt because it is possible to participate in a spring event which cannot be found in other countries and obtain valuable specimens. “In Russia one can hunt for wood grouse (capercaillie), which is forbidden throughout most of Europe but is considered a hunting trophy. In Russia it can also be hunted in spring, likewise a rarity,” says Bystrov. “In the country one can hunt in practically any territory except specially protected natural zones. Here hunting is more difficult and conditions are wilder. Germans and Greeks have always been interested in our hunting; Italians and French people also come; and before there were a lot of Spaniards,” Bystrov tells us. Business as usual in Crimea? He adds, however, that there is an inconvenient catch - private security employees must be able to reach such storage spaces within three hours in case of need, i.e. they must be within 50 kilometers of a village or settlement. “If people come for a tough trophy hunt and go out deep into the taiga, then they cannot return by evening to the hunting grounds in order to turn their guns in to storage,” explained the specialist. He mentioned that it is rather difficult to haul out trophies, too.